Bust-A-Move DS's setup is simple. Right off the main menu (after tapping on "Start") are two options: one for single-player ("Single") and one for multi-player. Downloading is straight forward and quick (around 27 seconds). There are a LOT of confirmation steps when setting up the link, but there are only two or three places you have to look, so it won't throw you off (or at least it shouldn't). Choices are set up well and the fields are large enough to tap on without tapping the wrong thing (though the options menu does cut that a little tight). There are, however, a couple of things that could have been designed better. The Options menu (where the host can change between touch controls and button controls) is an alternate option to "Start", where it would be easier to notice/access as a third option next to "Single" and "Multi-Player". It would also be nice if the game said somewhere that picking different characacters only meant that you'd see different pictures (different characters do not change the way the game plays - at all). 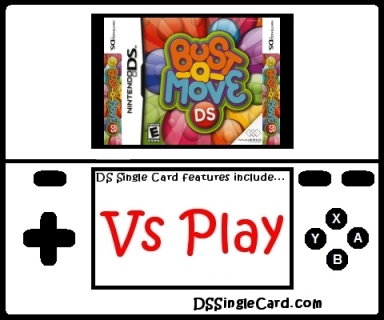 Bust-A-Move DS offers two methods of gameplay. One uses a touch-screen based control scheme, touch controls. The other method is a button-based system, button controls. Whether the host chooses touch controls or button controls, the guest is always using touch controls - and the game doesn't tell this to the host. The touch controls, though, are far more intuitive. They achieve a nice subtlety that is lacking in the button controls. With the touch controls, you can aim anywhere you want, to about a two degree accuracy. With the button controls, it jumps ten to eight to ten degrees at a time, making precise aiming difficult. Only use the button controls if you have really shaky hands. Otherwise, the touch controls are much easier, and more fun. The game will be set to touch controls by default. Bust-A-Move DS is a stictly 2D game, with a 3D shine to the bubbles. The backgrounds are randomly selected as you play through and are nice to noticely, but rightly ignorable when you're focusing on the game. The music and sound effects are fun, upbeat tunes that add to the atmosphere of the game. You can play with the sound off, but you'd actually be missing out the immersion factor (the feeling of actually being in an arcade). There are a few features to consider. One is the control scheme: touch controls versus button controls (discussed above). Another is the number of players: if you have fewer than five players, the host can choose to add in any number of computer opponents (up to a maximum of five players total). Finally, each player can choose their character. What does it mean when you choose one character versus another one? It means you have a different picture on your screen. It means your opponents will see a different picture representing you. What does it mean to how the game is played? Absolutely nothing. The game doesn't tell you that the play is the same, but it is. No difference. Whatsoever. Like most puzzle games, Bust-A-Move DS's level of fun depends on each person's enjoyment of puzzle game. If you don't like puzzle games, you won't like it. If you do like puzzle games, you will like it. If you think that puzzle games are the greatest thing invented since the knife used to slice bread, you just might ansolutely love it. Before Bust-A-Move DS, I had not played any games in the Bust-A-Move (or Puzzle Bobble) series, so this was my first exposure to it. I began (as is the default setting) with the touch controls. Within five minutes, I had them mastered (my aim, on the other hand, is still quite suspect). I then proceeded to try out the button controls and was thoroughly disappointed because of how superior the touch controls really are. I'm going to try the new Bust-A-Move Bash! for the Wii, but any version of the series that relies on button controls just won't a candle to how good/intuitive the touch controls are. This series was made for a game system with a touch screen interface from the start, even if the original designers didn't know it at the time. It's a fun game to pull out and play and the larger the group of people playing in the same game, the better and more fun it is. Make the different characters mean different gameplay (change the bubble drop speed, the number of colors, the music - something!). Add in more special bubbles (i.e. one that turns all bubbles of the color you hit with it blue or one that shoves all bubbles up a row). Program in an achievable power-up that can extend how far the dotted line (indicating the bubbles path) can extend. Put the Options menu on the same screen as "Single" and "Multi-Player", AFTER you tap "Start" on the lower screen. Say (in the game) that all guests will use touch controls. Click here to return to the DSSingleCard.com Bust-A-Move DS profile.